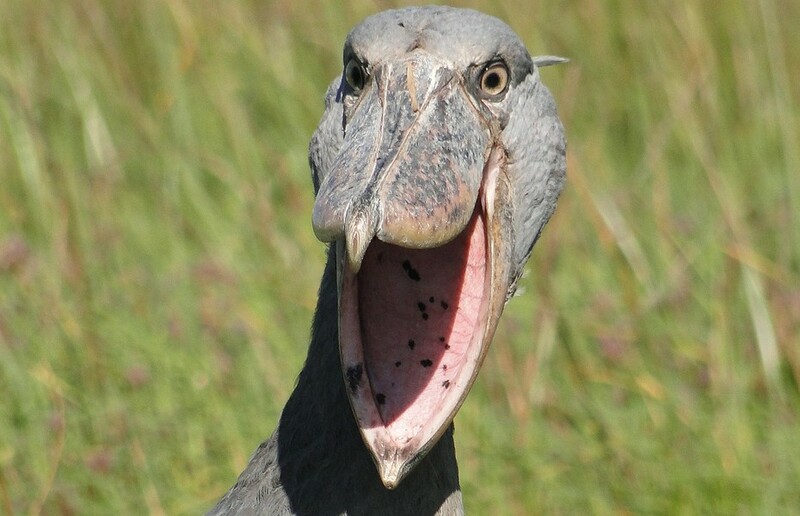 The African Shoebill rightfully claims its name as Africa’s swamp king. 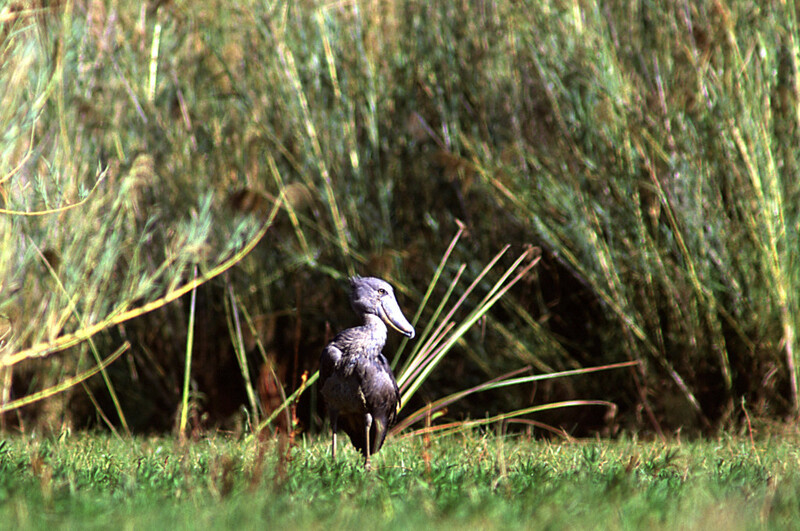 Shoebills are the ultimate fans of large, rich, dense marshes, wetlands, and swamps. This makes the Bangweulu swamps in Zambia the best place to witness a special sighting of one. Every May, Robin Pope Safaris takes a trip to the swamps in search of this prehistoric-looking and extremely elusive bird. Tracking them down on foot or in dugout canoes is part of the unique experience that makes it a bucket list safari. 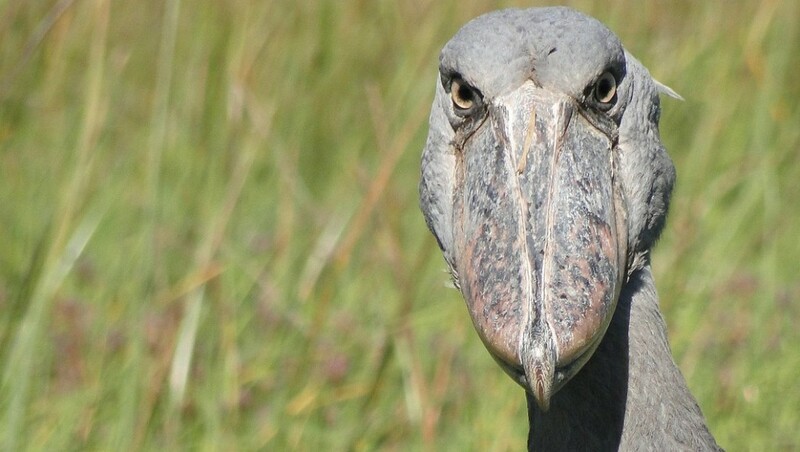 Based on his personal experience on these wild and remote excursions, Robin Pope Safaris’ guide Jason Alfonsi shares five interesting facts about Africa’s shoebill. While the shoebill is called a stork, genetically speaking it is more closely related to the pelican or heron families. They have the same little crest on the back of their head and both have a prehensile prickly tongue which they use to hold and pull food into their bill. The large bill is also similar in both birds with a hook or tooth at the tip. Their beaks can reach up to 24cm in length and 20cm in width, often giving the impression of an old big-nosed university professor peering over his spectacles! But don’t get too caught up in the funny comparison because their beaks mean real business and are used as a very precise fishing tool. The edges of their beaks are razor sharp, enough to decapitate a very large fish or baby crocodile. They may be referred to as the “dino birds” but they are also blessed with the blue-eyed gene. Some shoebills have exotic pale blue eyes that are quite striking to stare into. Coming face to face with one is the stuff of birding dreams! Bangweulu Swamps in the southern most extent of their distribution but they are also found in other marshy areas in countries like Sudan, Rwanda, and Uganda. They nest on papyrus platforms which is why their distribution only coincides with the presence of papyrus. David Lloyd, founder of the Kasanka Trust, collects African masks and it is known that he holds an old mask from Malawi which is clearly of a shoebill. This suggests shoebills were once in Malawi, in the papyrus swamps there too. Shoebills rarely raise more than one chick. The youngest chick is known to be“insurance” in case the oldest one doesn’t make it. The sinister sibling rivalry becomes apparent when the mother leaves to fetch water and the oldest chick attacks its younger sibling often drawing blood. With limited food supply, the mother favours the eldest ensuring one of its young survives. A trip to Bangweulu swamps in search for Africa’s shoebill demands to be on any birder or nature lover’s wildlife calendar. Fortunately, the opportunity presents itself every May on a Robin Pope Safari’s Shoebill Safari.